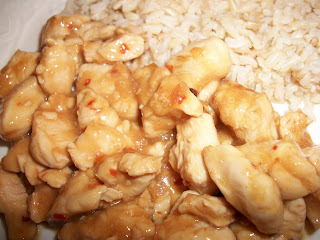 I finally found a recipe for General Tso's Chicken that is Weight Watchers friendly. I got it from http://www.recipezaar.com/ which states it is only 6 points. I wanted to find out how many points it would be without the rice and it came out to only 4 points. Next time I will serve it with a mixture of broccoli and cauliflower for less points. It is definitely a lot less points than the dish I got from the Chinese take out restaurant the other day. It doesn't taste exactly like the Chinese version, since it isn't dipped in oil and fried, but the sauce is really good. It is definitely a great alternative to the fattening version if you are trying to lose weight like me. When I crave Chinese food, I will just have this instead. Delicious!